When we were planning our trip, we had knew that the day which we had to visit the Tiger's Nest would be nothing less than a gruelling one. As expected, our previous day was bone-weary, back-breaking, and blistering. Well, we couldn't complain since we had taken the easy option of riding the horse for half the ascend, compared to our 2 Taiwanese friends who had walked the entire journey uphill. Nonetheless, everyone was still beaten and exhausted. Hence, we had included an additional day at the luxurious hotel, COMO Uma Paro, in our itinerary right after our momentous Taktsang climb. This is our well-deserved "off day" to recharge and recuperate from the Taktsang damage, and the hardship we had been through so far. But before we checked-in for some luxury pampering, we had to check-out temporarily from our hotel Tashi Namgay, which we would return again for our final night's stay. Loaded our luggage neatly in the back of our vehicle. Seems like we had not been shopping much. Getting to work in the early morning. We started the day with Kyichu Lhakhang, one of the oldest monasteries in Bhutan that was built in the 7th century by Tibetan Emperor Songtsän Gampo. Rows of beautifully painted prayer wheels fringe the temple building perimeter. Apparently, blue was the colour of the royalty in the past. Exquisite hand-painted motifs and lattices in Kyichu Lhakhang. An elderly man doing his prayers around the temple. One should walk around the temple perimeter in a clockwise direction, turning each prayer wheel clockwise, one at a time and not missing any wheel. This would spread blessings and well wishes. Getting back to our vehicle and joined by many new friends we made at Kyichu Lhakhang. Somehow, stray dogs just love us wherever we go. Our next stop was Rinpung Dzong, often called the Paro Dzong due to its location. Every man wearing Bhutan's traditional clothing, Gho, would have to put on their Kabney (a 3-metre long silk scarf) when entering important places or attending importance events. White Kabneys are worn by commoners. Our tour guide, Mr. Jigme, explaining the Bhavacakra in detail, layer by layer. It's more commonly known as the "wheel of life". The entrance hallway into Rinpung Dzong is adorned with colourful wall murals depicting many Buddhism teachings. Entering the inner compound of Rinpung Dzong. The Rinpung Dzong complex houses the district monastic body and government administrative offices of Paro. Including the Royal Court of Justice for Paro Dzongkhag (district). A large prayer hall in Rinpung Dzong with beautiful solid timber floor boards. Little Buddha? Apparently, the 1993 movie, Little Buddha, was shot in Paro's Rinpung Dzong and it's surroundings. A monk standing along the corridor. A group of monks gathering for some ceremony with a donkey. It was interesting to watch but we had no idea what was going on. A breath-taking panoramic view of Paro valley from the viewing balcony of Rinpung Dzong. The majestic white-washed fortress walls of Rinpung Dzong. The second floor balcony is where the previous panorama was taken from. Built in 1644, Rinpung Dzong is a shortened name for Rinchen Pung Dzong, which means 'Fortress on a Heap of Jewels'. We couldn't find any jewel despite sneaking up every nook and cranny. Crossing this wooden cantilevered bridge had marked the end of our morning Paro tour. 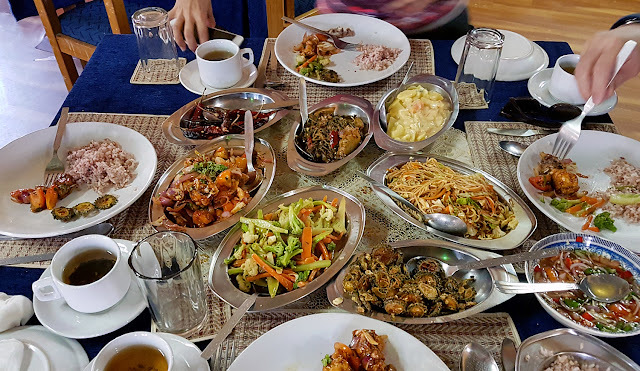 We headed back to Paro town to have lunch, which turned out to be a feast. We had been eating Bhutanese food all day everyday since we arrived, and we were still loving it on the 7th day. 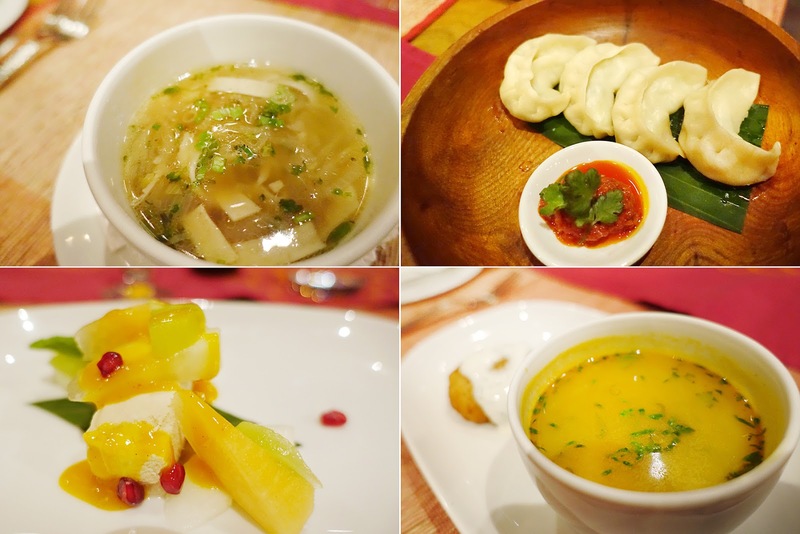 We decided to stay one night at the illustrious COMO Uma Paro Hotel for a different experience. Other than its fine rooms, impeccable service, and exclusivity, this is also the hotel which hosted the wedding of Hong Kong superstars Tony Leung and Carina Lau in 2008. Our rooms were not ready when we arrived. Hence, a friendly hotel staff, Ms. Yeshi, took the chance to show us around the hotel grounds, including the most luxurious headline suite - The COMO Villa! This is the humble living and dining space in COMO Villa. And most importantly, this villa was where Hong Kong celebrities Tony Leung and Carina Lau were staying during their wedding. The bathroom seems bigger than my own living room in Singapore. One of the two bedrooms in the villa. The villa comes with a private spa outhouse and outdoor hot stone bath. The spa outhouse could be converted to the third bedroom if necessary. The wonderful patio in front of COMO Villa - a perfect place for private parties under the stars. I could only imagine and fantasize for now, until I have USD1,800 to splurge for a night. Walking back to the hotel main building and checking-in. ...with a stunning view of Paro valley from our balcony. Our room key with a fish-bell key chain. In total, there are only twenty rooms and nine villas in this exclusive hotel. The hotel sits amidst the lush pine forest, offering a total sense of peace and tranquillity. Having tea and getting ready for my 2-hour spa treatment at the COMO Shambhala Retreat. The facilities are amazing. You may sign up for their free yoga classes, step into their well-equipped gym, or jump into this heated indoor pool. Not forgetting the details and brand experience. If you are looking to stretch your muscles, try archery on the hotel ground. Archery is Bhutan's national sport and any trip to this country would not be complete without a shot. We had an hour of fun with their bamboo-made bow and arrows, patiently coached by the hotel staff. I bet everyone would agree that the target board was a little too small. The target boards in Bhutan archery are known to be minuscule. This was my best shot of the evening, or the only arrow that hit the target board and stayed on it. Arrows that hit the target but fell off would not be considered. Ended our game of archery and heading back for dinner. The signature restaurant at COMO Uma Paro - the Bukhari. It's an award-winning restaurant and we were told that the royal family frequent this place. Started my wonderful dinner with a bottle of their favourite local fruity Weiss beer - the Red Panda. Our sumptuous dinner of mixed Bhutanese and Indian food at Bukhari. The portions may look small (it's a fine dining restaurant after all), but the wide variety and superb food quality had certainly made our dinner a highly satisfactory one! Amazing place to visit, thanks for sharing . I read your blog its very nice and informative,thanks for your valuable information about thimphu paro tour with us.